Join AL DÍA Talks for a conversation with the expert on diversity in Philadelphia's workforce, Uva Coles. 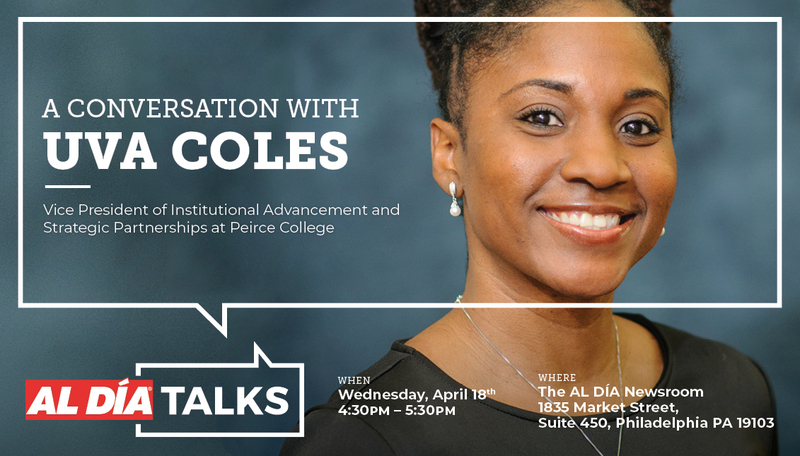 As Vice President of Institutional Advancement and Strategic Partnerships at Peirce College, a higher education institution that has been educating working adults for over 150 years, Uva Coles is leading the way for strengthening and diversifying Philadelphia's workforce. Throughout her career Coles has focused on creating inclusive and equitable workforce collaborations that align education, skills, and purpose. Coles has played a key role in the workforce steering committee, which designed the city’s new workforce initiative, “Fueling Philadelphia’s Talent Engine,” officially launched in February. As an Afro-Latina immigrant, Coles also focuses on and speaks to immigrant and Afro-Latinx issues and the intersectionality of gender and race. Coles has also held positions as Vice President of Student Services and Dean of Career Management at Peirce College. Prior to that she worked in various high-level nonprofit management positions, serving as Vice President of Intake Service at Big Brothers Big Sisters in Southeastern Pennsylvania and as manager of corporate services at INROADS/Mid-Atlantic. Coles attended Claflin University in South Carolina where she received her BA in English and Criminal Justice, and went on to get her Masters of Science in Organizational Leadership from Wilmington University in 2015.